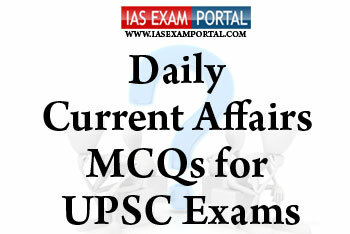 Current Affairs MCQ for UPSC Exams - 13 April 2019 | IAS EXAM PORTAL - India's Largest Community for UPSC Exam Aspirants. Q1. With respect to the official data on the economic prospects of the first quarter, which of the following statement are true ? 1) Industrial growth slowed to 0.1%, driven by an across-the-board slowdown, especially in key sectors like manufacturing, mining, capital goods, and infrastructure, according to latest official data. 2) Inflation is still well below the average threshold of 4% and food prices have just turned positive, and vegetable prices are much less negative than the trend. 3) In order to meet the 3.4% fiscal deficit target, it appears the government has gone in for curtailing expenditure in general, and capital expenditure in specific. Q2. Which of the following statements with respect to peninsular rivers are nottrue ? 2) The delta of Krishna along with the delta of Godavari is known as the “Rice granary of India”. 3) The River Narmada originates from Amarkantak in Satpura range and flows through a rift valley without forming any waterfalls. 1) Radio carbon dating is a method for determining the age of an object containing organic material by using the properties of radiocarbon, a radioactive isotope of carbon. 2) Naturally occurring radioactive isotopes can also form the basis of dating methods, as with potassium–argon dating, argon–argon dating, and uranium series dating. 3) Carbon dating is the most apt technique used for determining the ages of ancient fossils of mammals and dinosaurs. Q4. With respect to the Independent candidates taking part in an election,which of the following statements are true ? 1) The Law Commission of India in its report on 'Reform of Electoral Laws' has also said that independent candidates should be debarred from contesting elections to the LokSabha since they are not affiliated to any political parties. 2)There has been a constant increase in the number of successful independent candidates in all general elections in India. 3) In some countries where politics is otherwise traditionally partisan, such as Mongolia, the incumbent President must always be an independent and cannot run for re-election as a member of a political party. Q5. The place “Aathichanallur” frequently seen in news has been the site of a number of very important archaeological finds is a place in which of the following states of India ?